SynthPunk's blog: and now for something completely different..
i started building this from scratch a couple of weeks ago. 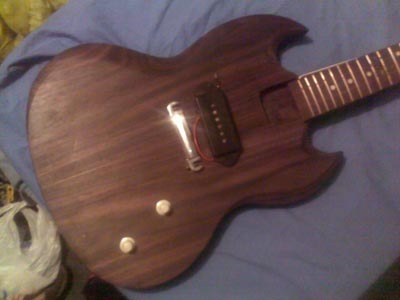 its a semi-acoustic (chambered) SG junior body made from Indian Rosewood. ive got the body about 80% done and the necks about 30% done. yay wood. the fretboard shown above is just for the photo. the one its actually going to get is a waaaay more psychedelic piece of brazilian rosewood. the necks brazilian too.. heavy, but should sound pretty weighty too. anyways - the next few posts will be back to video synths, i need to sort out the bandsaw before i do any more on this.